Small children. Since mushrooms are ok to touch, you don't have to freak out if you see your toddler handling an unknown mushroom. But of course little kids like to put things in their mouths. So like any outdoor exploration, supervision is highly recommended. In my own case as a father, my kids are supposed to ask before handling any mushroom (they are always very excited to share their finds with me). Mixing species in your collection basket (or hat, donut bag, guitar case, whatever you might happen to have). If you have collected a bunch delicious edible species, don't mix in unknown species. Why take the chance of overlooking it or a piece of it later in the kitchen and accidentally cooking up something poisonous, deadly or otherwise. Tasting for identification. A lot of field guides often list taste as a feature to consider for identifying a mushroom. I taste unknown mushrooms occasionally, but never did when I first started learning about them. 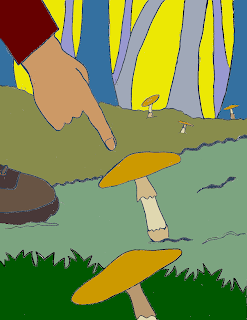 But for me, a taste test comes with some already good ideas as to the mushroom's identity. And it's taste only, not ingestion too. So if mushroom study is something you're interested in, handling should be fine for closer study. Or if you just enjoy mushrooms for their aesthetic value, you can expand your appreciation tactically. And while you're at it, don't forget aromas, many mushrooms have distinctive smells. And don't forget to wash your wands. But you should be anyway, right!